This time next week the citizens of Newark will be spending their first day represented by a brand new MP. I’m amazed it’s taken this long for someone to commission and carry out a poll. This one was done by Survation for the Sun. Hopefully there’ll be others between now and election day, so we’ll be able to get a sense of any trends. I shouldn’t think the results of this particular opinion poll will come as a surprise. 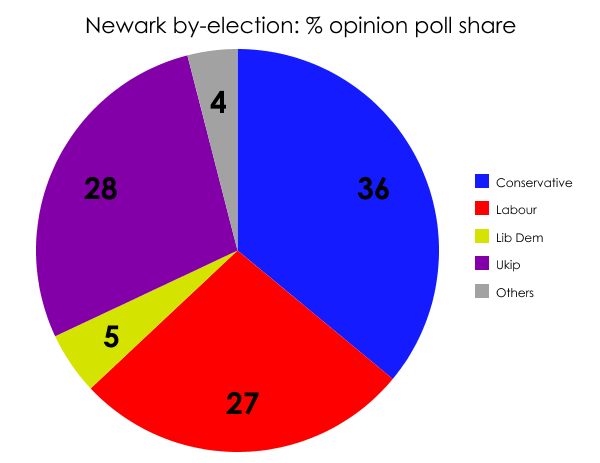 Newark is one of the safest Tory seats in the country. It’s being well-documented that the party is mounting a huge campaign to see off any notional Ukip threat. I’m fully expecting the Conservative candidate to win next Thursday, albeit with a reduced majority (and pending any legal challenges). But a Tory victory, though expected, will still be somewhat historic. For it would be the first time a Tory government has successfully defended a by-election seat since February 1989 – a gap of over 25 years. That symbolic last stand took place in the constituency of Richmond. The winner? None other than the current foreign secretary, William Hague.